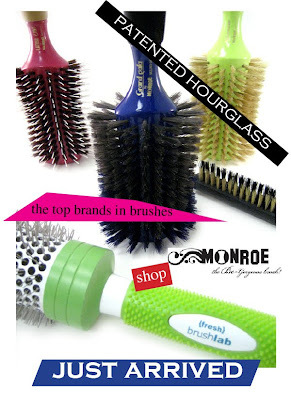 Monroe Hair Brushes have arrived. • Hourglass barrel for even control of the roots. Creates perfect tension all across the bristling area, to provide a perfect styling, because it mimics the shape of the head. • More Control = Better Results. More control of the hair because the flat section of the hourglass shape keeps the hair within the bristling area. • Beautiful finishing of the ends. The hourglass shape allows for better control of the ends. • Extra light weight in wood handle with foam for comfort of use.